i've been planning our dinners each week for more than a year now. maybe two years. i've lost track. it was a commitment i made to plan our meals in advance in effort to have a better handle on the "witching hour", you know, that time of day when the "what's for dinner" panic sets in. it has worked. every Sunday after church i plan our meals for the week, make a coordinating grocery list, and clip coupons. every Sunday. for more than a year now. maybe two years. i've lost track. while it has worked wonderfully, it gets old sometimes. i've hit meal planning burnout more than once. i get tired of the same dinners and lose inspiration to try new things. sometimes i get lackadaisical and plan to fail fail to plan. and those weeks? are no good. the witching hour gets the best of me as i scramble frantically to put together a decent dinner for my family. a frantic mama is not a happy mama. i have learned 1) the importance of meal planning and 2) the importance of preventing meal planning burnout. 1) keep a notebook (or excel spreadsheet) of your meal plans. highlight or draw big puffy hearts around the meals that your family loved. put a question mark next to the meals that didn't go over so well. 2) use other people's menu plans for inspiration. i love to look at the meal plans at OrgJunkie.com and the meal plans linked up to her Menu Planning Monday. sometimes i'll send an email to friends asking what they are planning for dinner this week. i also do a Twitter search for #menu and #whatsfordinner to get ideas. i have found awesome recipe resources in doing this! 3) get your family involved! i ask my kids and my husband this, "is there anything special you'd like to have for dinner this week?" i am usually pleasantly surprised at their requests. 4) hold yourself accountable to your meal planning. whether this means blogging about it and joining a link up like the one at OrgJunkie.com, partnering with a friend to help plan meals, or even emailing the week's menu to your husband. 5) plan to plan. like i said, Sunday afternoon is my menu planning, coupon clipping, grocery list making time. this fits in with our after church schedule and gets me prepped for week. i feel accomplished at the start of the day Monday knowing that i know what's for dinner all week. and that's it. my keys to preventing menu planning burnout. it's worked for me! and i hope it will work for you, too! 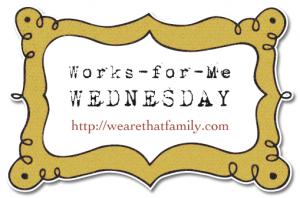 find out what else is working at WeAreTHATFamily.com's Works for Me Wednesday.